The Patriots have won four in a row and are now alone atop the division at 5-2, they won their first road game of the season against division leader Chicago. But in doing so, they made life quite harder than it had to be with some really sloppy mistakes and some poor play at times. They could have, should have won a lot more comfortable than 38-31. But that’s why they play the games. With the extremes of highs and lows, this one is rather difficult to get an accurate reading on. Several players made bad plays and then redeemed themselves with very good or even great ones. So we’ll dive in and after watching the game for the third time this afternoon, try to get an accurate read on this one. Tom Brady began the game as a man possessed. He chewed up the Bears much-ballyhooed defense like he was facing the London Silly Nannies not the Monsters of the Midway. The Patriots skewered them easily and waltzed down the field for a TD. Things got a little more difficult once Sony Michel went down after just six snaps. Already missing Rob Gronkowski, he spread the ball around and had a very good statistical day, completing 25-36 for 277 yards with 3 TDs and 1 INT. That pick was another pass that went from his receivers hands and flew out straight into a defender’s. He wasn’t perfect on the day but he was plenty good enough, his QB rating of 108.2 would have been around 120 without that weird pick on the throw to Develin. James White, Mr. Reliable was tasked to do a lot more once Sony Michel went down on the first play of the second quarter. White caught 8 passes for 57 yards and two touchdowns and ran for 40 yards on 11 carries, including several at the end of the game while the Patriots were running down the clock. Kenjon Barner came in when Michel went down and played okay, considering he doesn’t get many snaps and has been just relegated to spot duty. He had 10 carries for 36 yards and against a good run defense of the Bears, that isn’t bad. Brady had one carry for six yards and Cordarrelle Patterson had one for four and a first down. Michel went down with what appeared to be a really bad injury, but minutes ago Ian Rapoport of NFL Network said, that there was no structural damage and he appeared to dodge a major bullet. Michel was off to another very good start. He had four carries for 22 yards and one catch for 13 yards, not bad production at all for just six snaps. The wide receivers were once again solid for the Patriots in Chicago. Josh Gordon caught four passes for 100 yards, including a 55-yarder where he ran out of gas on the one-yard line and was tackled from behind. His lack of conditioning due to his lingering hamstring issue was at play there, Gordon said after the game that he was gassed after going on that 96-yard drive. His catch from Brady to convert a first down where he went up over a defender and came down with the ball, smashing his head on the turf as a result was a beauty. Chris Hogan had an uptick in targets with Gronk and Michel out and had another solid afternoon pulling in six catches for 63 yards on seven targets. 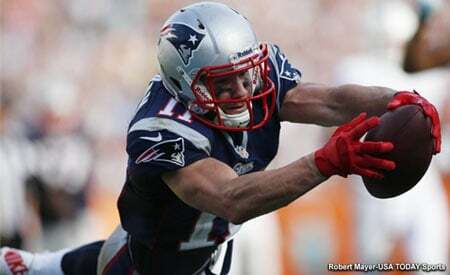 Julian Edelman chipped in with 5 catches for 39 yards. Phillip Dorsett had one catch for 8 yards on the day. With Gronkowski and Jacob Hollister out, Dwayne Allen was the only tight end active in Chicago. He did very well in the run blocking department, which he always does. On one key play in the fourth quarter, he pancaked Khalil Mack allowing White to pick up the first down. However, he was a non-factor in the passing game, he ran several routes but was not targeted. The offensive line was very good against a Bears defense that was supposed to be much, much better than the Chiefs unit that they faced the week before. They still rolled up over 100 yards on the ground and averaged 4.0 yards per carry despite losing their top runner in Michel. When the Bears knew they were going to run at the end of the game, they still did well. Here is where they needed Jeremy Hill back but the line play was good. In pass protection, overall they were outstanding. The only sack was a communication breakdown where an interior lineman was left unblocked. But overall the offensive line pass protection gave Brady plenty of time to survey the field. Mack and Leonard Floyd, the Bears best pass rushers were handled. The defensive line? Here is one of those quandaries that we mentioned above. Did they stuff the Chicago running backs? Absolutely. Bears running backs gained only 53 yards on 19 carries, which is less than 3 yards a pop. Did they pressure Trubiski, which was part of the game plan? Yes, they did and did so pretty consistently (with help) all game long. They still have some issues getting home and finishing up with sacks (they had two, one by Deatrich Wise, one by Adrian Clayborn) but the pressure was pretty consistent all game long. But in containing Trubiski and stopping him from running? The line was horrible, and that may not be exaggerating things. They did a really poor job of containment and Trubiski was able to escape much more often than not. And when he ran, he ran extremely well, gaining 81 yards on six carries, a 13.3-yard average. The linebackers were okay, on Sunday and two combined for one of the turning points of the game. Dont’a Hightower burst thru the Bears line and blocked a punt that Kyle Van Noy scooped up and returned for a touchdown. It gave the Patriots a lead that they would not give up. The linebackers filled in nicely in the running game. Van Noy had an excellent text play of setting the edge, stringing along his blocker and then forcing the speedy Tarik Cohen out of bounds for a three-yard loss. Elandon Roberts, Hightower, and Van Noy all had times creating pressure and they did that fairly well also. Van Noy in particular, had pressure on Trubiski on the final Hail Mary which no doubt had something to do with the pass not reaching the end zone. But they weren’t much help in containing Trubiski, although when they placed Van Noy to spy him, he seemed to do well, albeit for a few plays in the first half. Roberts had a gift interception airmailed to him in the end zone and dropped it. The Bears scored on the next play….that hurt. The secondary was once again a quandary. Stephon Gilmore had another stellar game, he blanketed whoever he was covering. But he too dropped an interception that two plays later was turned into a Bears touchdown. Jonathan Jones made an outstanding play in the end zone for a pick, high pointing the ball. However, J.C. Jackson had three penalties all of which hurt because they were drive extenders. But he too made some redemption later when he made a very difficult interception of a Trubiski pass. They made the difficult ones and let the gifts get away. Pat Chung had a pass breakup but Harmon had a holding penalty and every time they went to zone, Trubiski hit Trey Burton wide open down the middle of the field. Nowhere was the discrepancy between good and poor play as distinct on Special Teams. Rewatching the tape, Patterson’s fumble wasn’t caused by the Bears but by Nicholas Grigsby. That wasn’t good, the penalties on Crossen and Nate Ebner were worse. Then Edelman nearly had another turnover where a punt bounced off of his face mask but he was able to recover. Ryan Allen is normally excellent at placing punts inside the 10, but his yesterday sailed badly deep in the end zone. A delay of the game on the kickoff? But then there was the good. Patterson’s 95-yard TD on the kick return was outstanding. He nearly had another with a 38-yarder later in the game. Hightower’s punt block and Van Noy’s scoop and score bumped the score up much higher than where they started. The Patriots had another excellent game plan offensively. Josh McDaniels, I’m sure had to change things up with Gronkowski out and it started off swimmingly. Then they lost Michel after just six snaps and everything had to change again. All in all, without Gronkowski and Michel, the offense did pretty well for itself. The defensive game plan was sound and they started off pressuring Trubiski. They tried to force mistakes…which they did but they didn’t capitalize on many of them. Worse, they lost containment on several plays allowing him to make big plays with his feet. That is a performance issue and a coaching one as well. But despite the sloppy play, turnovers etc. they Patriots persevered and won a tough game on the road against a division leader. They are 5-2, are all alone at the top of their division and have a week to prepare for Buffalo on Monday Night Football. 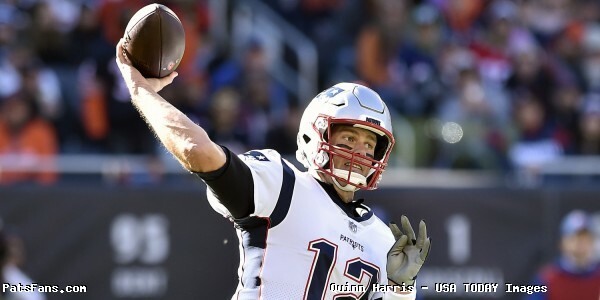 This entry was posted in 2018 Patriots Regular Season, NFL Commentary, NFL News, Patriots Commentary, Patriots Film Room, Patriots News and tagged 2018 NFL Season, 2018 Patriots season, Adrian Clayborn, Bill Belichick, Buffalo Bills, Chris Hogan, Dont'a Hightower, Julian Edelman, New England Patriots, NFL, Patriots, Rob Gronkowski, Stephon Gilmore, Tom Brady, Trey Flowers on October 23, 2018 by Steve Balestrieri.